What is a land conservation trust? A land conservation trust is a local non-profit organization that promotes the preservation of open space lands for current and future generations. Land conservation trusts are active in many Connecticut towns and across the United States. 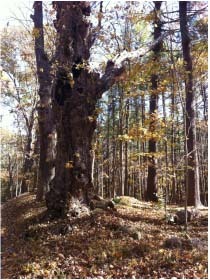 The Hamden Land Conservation Trust was founded in 1969. Today it is the caretaker and protector of a variety of open space lands throughout the town. Our land conservation trust works to make Hamden a better community to live in by connecting people to the land and preserving places where people can appreciate nature, as well as protecting the land and woods that purify our streams and reservoirs. How can I participate in the Hamden Land Conservation Trust? There are several ways in which you can become involved. First of all, become a member, for a year or for life. Your membership provides both financial and moral support for the Hamden Land Conservation Trust's work. Second, become a volunteer, outdoors or at your desk, and get the satisfaction of contributing your energy and ideas to the organization. And finally, consider a tangible donation to the goal of preserving open space by a larger gift of money, land, or an easement. Please contact us for more information. In what parts of town is the Hamden Land Conservation Trust active? Just as Hamden contains a diversity of people, so too its wide array of landscape includes urban neighborhoods in the south part of town and rural neighborhoods in the north, salt meadows along the Quinnipiac River and forested hills where the town adjoins Bethany and Cheshire, with lakes, ponds, and streams scattered throughout. Walking corridors such as the Farmington Canal Trail and the Blue Trail system connect Hamden's parks and open spaces. The Hamden Land Conservation Trust is active in all parts of town. For example, we own a two-acre wooded parcel including a glacial kettle at the intersection of Mather and Servoss Streets and a quarter-acre plot with a rock formation known as "the Brethren" on Shepard Avenue. Our involvement in all parts of town comes from the recognition that open space, walking trails, nature parks, and wooded parcels are vital, along with flourishing schools, businesses, and housing, to making every neighborhood a good place in which to live and raise a family. How does the Hamden land Conservation Trust operate? The Hamden Land Conservation Trust protects land in two ways. First, we acquire land by gift, bequest, or purchase. Second, working cooperatively with private land owners, we hold conservation easements, which are permanent agreements that allow the land owners to continue to enjoy their property while assuring that it will remain free from development for all time. The land we protect can be inaccessible, or it can be open to passive recreational use by the public, with trails for hiking and limited facilities. Either way, it provides habitats for plants and animals and contributes to the aesthetic and environmental enrichment of the community. Generous people have donated their land or development rights to the Hamden land Conservation Trust. Many of these donations have been tax deductible, because the Hamden Land Conservation Trust is a non-profit corporation. Does the Land Trust own all its properties outright? We own and maintain a number of properties. Other properties are protected through a legal agreement known as an easement. Our conservation easements include a 51-acre tract of forest, shrub cover, and ledge at Gaylord Mountain Road and West Todd Street. A conservation easement is a power invested in a qualified private land conservation organization (often called a "land trust") or government (municipal, county, state or federal) to manage or control the exercise of rights otherwise held by a landowner so as to achieve certain conservation purposes. It is an interest in real property established by agreement between a landowner and land trust or unit of government. The conservation easement "runs with the land," meaning it is applicable to both present and future owners of the land. As with other real property interests, the granting of a conservation easement is recorded in the local land records; the grant becomes a part of the chain of title for the property. Ensure that lands are managed so that they are always available for open space, forestry or agriculture.